The Journal of Chiropractic Humanities (ISSN 1556-3499) is a peer-reviewed journal devoted to providing a forum for the chiropractic profession to disseminate information dedicated to chiropractic humanities. 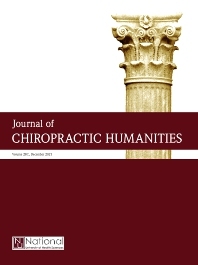 The primary purpose of the Journal of Chiropractic Humanities is to foster scholarly debate and interaction within the chiropractic profession regarding the humanities, which includes history, philosophy, linguistics, literature, jurisprudence, ethics, theory, sociology, comparative religions, and aspects of social sciences that address historical or philosophical approaches. The journal's objective is to fulfill this purpose through careful editorial review and publication of expert work, by creating legitimate dialogue in a field where a diversity of opinion exists, and by providing a professional forum for interaction of these views. The journal is currently indexed in Cumulative Index to Nursing and Allied Health Literature (CINAHL), Manual Alternative and Natural Therapy Index System (MANTIS), and the Index to Chiropractic Literature (ICL).